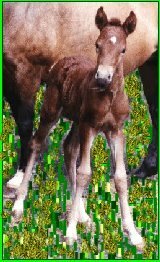 Brookdancer was one of a group of foals that was born to the herd of wild horses that spring. She was a beautiful little horse with an especially long tail and mane that her mother Lightfoot thought were just lovely. Baby horses get up on their feet very soon, but Brookdancer seemed to want to wait. "What's the matter, dear?" asked Lightfoot, who licked her with her tongue as mother horses will do. "I'm afraid, mother," answered Brookdancer in a scared little voice. "Afraid of what?" she asked him. "Afraid that I'll fall down," she said. "Well of course you will!" laughed her mother. "We all do when we're learning. Then you just get up and try again and before you know it you'll be running and playing with the others." Brookdancer was doubtful, but she tried, and sure enough, she fell down. She didn't want to try again because she was afraid she might fall again, but Lightfoot urged her to keep trying. So she did and pretty soon she was up and walking and then running with the other foals. They were all playing a game of tag. Thunderhoof came running up to Brookdancer. "Come play with us!" he said excitedly. Brookdancer shook her head. "I'm afraid." "Afraid of what?" he asked. "Afraid I'll make a mistake. I don't know how to play." "But I'll show you," said Thunderhoof. But Brookdancer shook her head again and Thunderhoof rejoined the others in their game. Brookdancer looked longingly at them. They were having such fun. 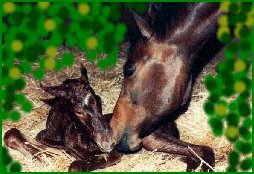 Soon the other foals no longer even asked her if she would like to play or explore or do anything because Brookdancer would always say no. She was always afraid she would do something wrong or make a mistake and she wouldn't try. One day Lightfoot found her little daughter crying beside the big oak in the center of the meadow. "What's the matter dear?" asked Lightfoot. "Oh mother!" sobbed Brookdancer. "They've all gone off to a patch of strawberries that Thunderhoof found and I love strawberries." "Well why didn't you go?" "They didn't ask me and anyway you have to jump across the stream to get there and I'm afraid. Would you go and get me some strawberries Mother?" Lightfoot shook her head even though she did not like to see her child unhappy. "I can't do this for you Brookdancer. If you want those strawberries you're going to have to learn to jump the stream and not be afraid to make a mistake, and if you do make a mistake--why, try again." "Will you come and watch me mother?" Brookdancer asked with the shaky voice which came out whenever she was afraid of something. "No," said Lightfoot. "This time you must do it on your own. Think about what you want to do and try it. And keep trying." She nuzzled Brookdancer with her soft nose. "You'll do just fine. And I'm proud of you just for trying." With that she walked away. Brookdancer stood there for a while thinking about those strawberries. The more she thought about them the more she wanted them. And the more she wanted them the more she knew she would have to jump the stream. She walked up and down beside the little stream for a long time. Finally she just backed up and ran and took a big leap. Her back hooves landed a little in the water, but she had made it to the other side! She went down one wrong path looking for the strawberry patch, but she didn't give up. The next path turned out to be the right one. 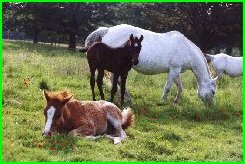 The other foals were happily eating strawberries. Thunderhoof looked up to see her. "Brookdancer! You made it! Good for you." He ran over to greet her. "Look everyone-- Brookdancer's here." 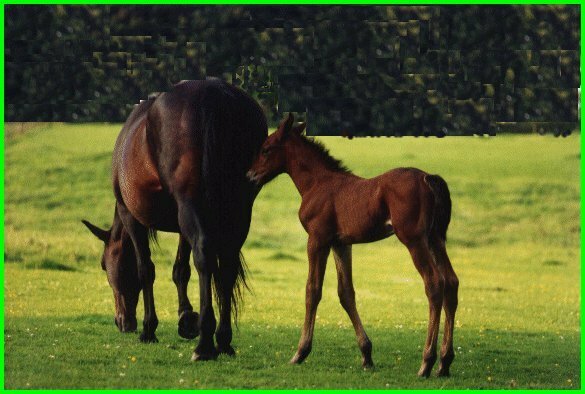 The other foals came up to her and said hello and how happy they were that she had found her way at last. And from that time on Brookdancer knew that it was better to try, and make a mistake, than it was to stay home and never taste strawberries.